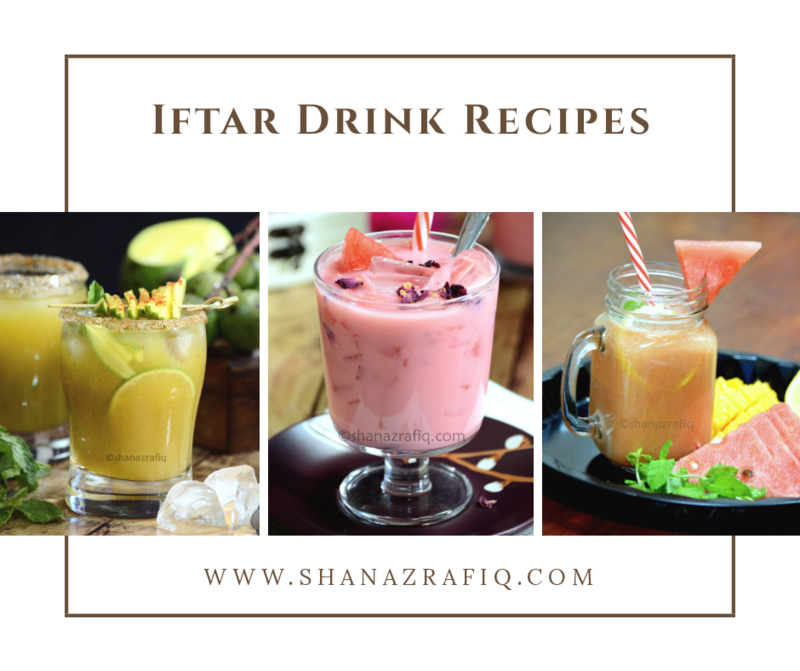 A food blog with recipes of breakfast, main course, desserts, cakes, kababs, curries, snacks and juices. Watching cooking shows on tv with my diary and pen is my favorite pass time. And this how I had started collecting recipes much before my blogging days. Initially, I didn't have many options with cooking shows and channels...Khana Khazana was the show I would watch for Indian recipes and Martha Stewart for cakes and bakes. The kitchen decor and the cutlery Martha used in her shows would always distract me from watching the actual cooking of hers. Tandoori Chicken Roll is also inspired by a Canadian tv show on Food Network which is all about food trucks and street food. The name of the show is 'Eat Street' hosted by James Cunningham who tries out all kind of truck food dishes. There was one particular food truck which served Indian food and the tandoori roll was supposed to be the most popular one. They tried to make it more creative by preparing their own achari flavored mayonnaise along with tandoori chicken bite-size pieces, a mint chutney and some crisp salad for the crunch. Here is my version of a Tandoori chicken roll where I have added a layer of omelet which is of course optional. In case if you are not an egg fan, you can very well opt it out. This tandoori roll can be made with leftover tandoori chicken pieces as well. How to make mint chutney for rolls? Mint chutney for rolls has to be slightly dry and not watery in texture. You will find different kinds of recipes on my blog for this chutney but for a whole wheat roll, we need to be very careful so that the wrap does not get soggy. Store this chutney in a dry glass container up to 4 to 5 days in the refrigerator. You can also pour into the ice tray cubes and freeze. Tandoori flavored chicken pieces wrapped in whole wheat bread with crunchy vegetable salad and mint chutney. 1. In a bowl mix together boneless chicken pieces with yogurt, ginger garlic and green chili paste, Tandoori masala powder, salt and lemon juice. Marinate for 30 minutes. While the chicken is marinating, you can prepare the rotis, mint chutney and salad. 2. Heat cooking oil in a deep pan and cook the marinated chicken till fully done. Add chopped onion and chopped capsicum to the chicken pieces and cook on high heat for 2 minutes. Make sure that onion and capsicum are crunchy and not overcooked. 3. Remove the chicken stuffing and set aside. 4. Whisk 2 eggs along with salt and pepper. Heat butter in a non-stick pan and add a tablespoon of egg mixture and swirl the pan around to make a thin omelet. Place a roti on the omelet and the flip on the other side so that the egg gets stuck to the roti. (watch the video to see this step). 5. Remove the egg roti from the pan and spread a tablespoon of green chutney over the wrap. Place some tandoori chicken stuffing along with some salad. 6. Wrap the roll in a sandwich paper or foil paper and serve hot. I have been receiving a huge request for this recipe of Palak Gosht and it has been on my list for a long time. So here I am with this humble version of this curry with a short and brief video. The biggest query people have about making this curry is, whether the spinach should be used in chopped or pureed form. And the next question arises as to, in which order it needs to be added. I prefer to add the spinach puree at the end of the cooking process. I personally do not like the idea of adding chopped spinach to this curry even though it is the easy way out. It is much appealing when the curry has a rich green color. To maintain the color of the spinach, it has to be blanched and while cooking in water, a bit of sugar helps in keeping its color. Shocking the leaves in chilled water also helps it to retain its nutrients as well as its color. Overall, it is a very simple and no fuss curry, and if you already have ginger and garlic paste ready, just add it along with chopped green chilies. This way you can skip the step of grinding of ginger, garlic, and green chili. Indian style curry with a combination of mutton and spinach, best served with ghee rice or naan. 1. Make a fine paste of chopped garlic, ginger and green chilies. Marinate mutton pieces with this paste, yogurt, and salt for 30 minutes. 2. Wash the spinach leaves and cook in boiling water with some sugar for 3 minutes. Remove the leaves from hot water and place it in ice water for some time. Grind the leaves to a coarse paste and set aside. 3. Heat cooking oil in a pressure cooker and add all the whole spices. Add chopped onion and fry till light golden in color. 4. Now add the marinated mutton, 1 tablespoon coriander powder, 2 teaspoon cumin powder, chopped tomato and 3 cups of water (or as needed) in which spinach was cooked. Place the lid and cook the mutton for 15 minutes on medium heat. Once the pressure drops, open the lid and check if muton cooked. Add salt if needed. 5. Finally, add spinach puree, garam masala powder, lemon juice and coriander leaves. Taste and check the seasoning. Cook the curry on low flame for 5 minutes. Turn off the flame and serve hot. 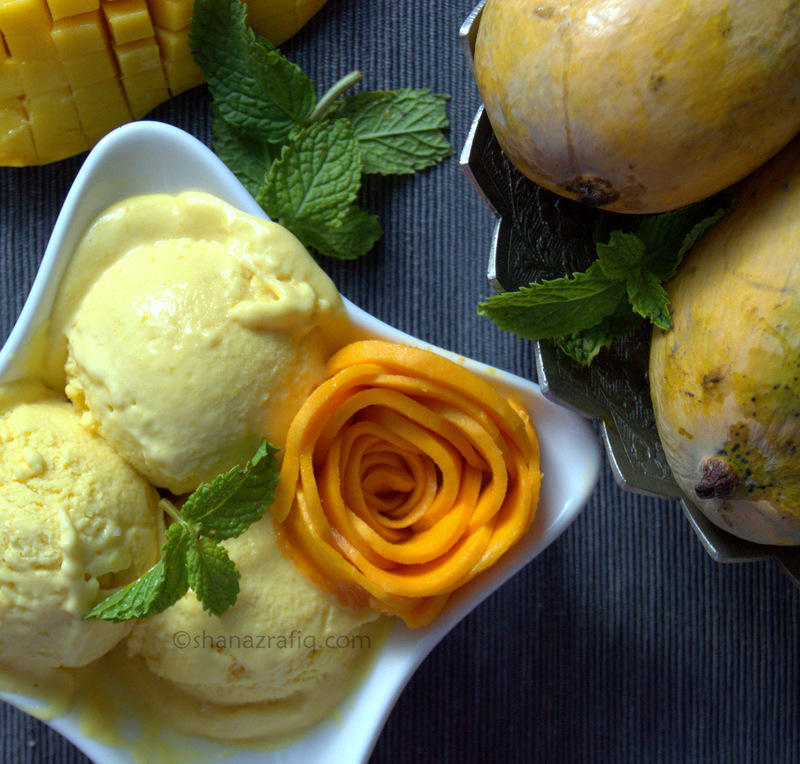 When I say 'real' mango ice cream, I mean it is the ice cream with real mango and real flavor which is impossible to relish in a commercial one. When you buy Ice cream from a shop, all you can see and taste is the artificial color and the strong mango essence in it. 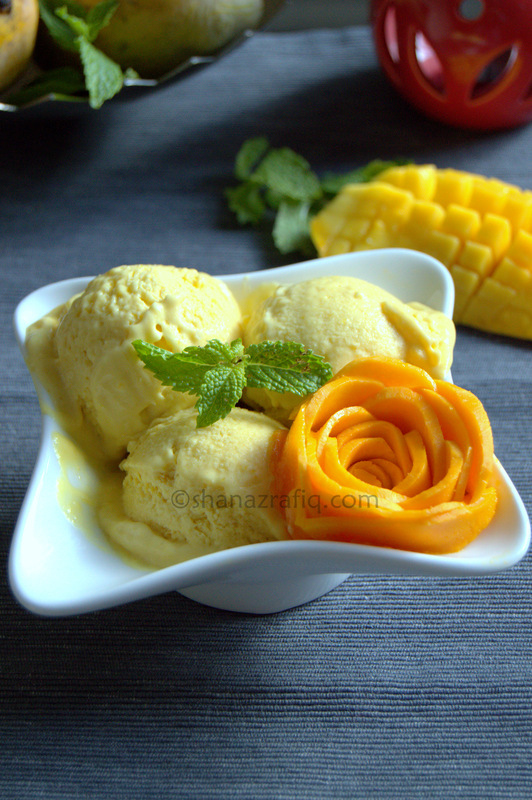 So if you are looking for a good mango ice cream in the comfort of your home, then all you need is 3 ingredients, and 30 minutes of your time and effort. Make the ice cream without an ice cream machine and forget about it for 12 hours. At the end of these 12 hours of waiting, get rewarded with this homemade comfort food kind, full of flavors and scoopable ice cream. When you remove this homemade ice cream from the freezer, you might find it as hard as a rock, or it depends on the temperature of your freezer. All you have to do is, just keep it in room temperature for about 10 to 15 minutes before serving or scooping out. I promise, its worth the wait and you will not be disappointed. The good news is that now you can make ice cream with the flavor of your choice. Just substitute the mango flavor with the choice of your fruit and your personalized flavored ice cream is ready for you in the freezer of your own kitchen. Stay tuned to see more such ice cream recipe coming soon on the blog. 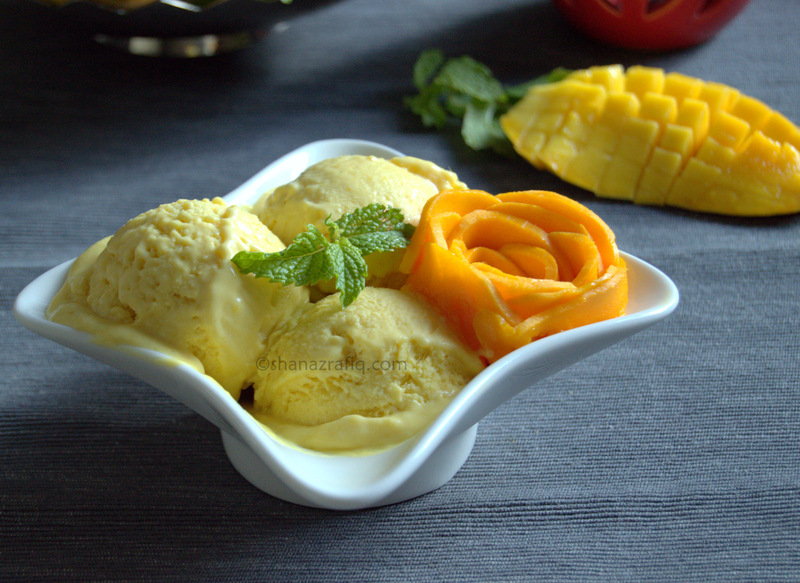 Quick and easy mango ice cream which requires no ice cream maker and free of artificial colors and additives. 1. Cook the mango puree on low flame for 10 to 15 minutes till all the water in mango evaporates and you get a thick pulp. Set aside and cool completely. 2. Whip the cream using a hand beater or manually till the cream thickens and forms peaks. 3. In a large bowl, mix together mango puree and condensed milk. Then slowly add whipped cream little at a time. Mix well till well combined. 4. Pour in a freezer-proof container and cover with a lid or a cling wrap. Freeze for 5 hours, remove from freezer and stir again. Return the container back to the freezer to set completely. 5. Remove from freezer 10 minutes before serving. Serve chilled. Mango sticky rice was on my to-do list and I desperately wanted to upload it before the mangoes go out of sight. Ever since my visit to Thailand, Mango sticky rice is that one dessert which had an indelible effect on my taste buds. This dish which is a popular street food is available anywhere you go makes it an ideal snack to keep you full for a long time. I love the combination of the warm steamed rice with the extra richness from the coconut milk and refreshing chilled mangoes on the side, topped with the roasted mung bean which gives a nice nutty crunch. If ever you are planning to visit Thailand, please do not return before trying this divine dessert...and the good news is that the people in Thailand make sure to keep the mangoes well in stock even during the offseason. The rice used in making this dessert is a special kind, which is glutinous in nature. It is mainly grown in southern parts of East Asia. Normally any raw rice is slightly transparent in appearance, whereas the glutinous rice has opaque grains as though the rice has already been soaked and dried. The term 'glutinous' does not mean that it has gluten, but to indicate the sticky or glue-like texture after it has been cooked. How to cook the 'Glutinous Rice'? This rice is not cooked in a regular way, where we bring the water to a boil and add rice to it. Glutinous rice is cooked without adding it directly to the water ie by just steaming it wrapped in a leaf or a bamboo basket and if both are not available, you can use a muslin cloth. The rice is first washed thoroughly and soaked overnight. After the rice has been soaked for a minimum of 6 hours, the water is then discarded and the soaked rise is placed on a muslin cloth. The cloth is then wrapped and steamed for about 30 minutes. Once the rice is cooked, it might still look uncooked. The rice is then soaked with sweet coconut milk for another 15 to 20 minutes. At this stage, the rice absorbs all the coconut milk and puffs up, taking in all the moisture and flavors from coconut milk. The rice can be slightly reheated before serving or can be served at room temperature as well. Here I have used a tinned coconut milk. If you wish you can extract fresh coconut milk and use it as a combination of thick extract and thin extract in 2:1 ratio. But the tinned coconut milk goes well with this recipe. A traditional Thai dessert where steamed glutinous rice is served with sweet coconut milk sauce and fresh mangoes. 1. Wash the rice and soak it for 5 to 6 hours or overnight. 2. Heat the steamer with enough water. 3. Take a muslin cloth and place the soaked rice in it and wrap the cloth. 4. Place the wrapped rice in the steamer and steam for 20 minutes (spread the rice and make it flat for even cooking). Turn the pouch of rice on the other side and again steam for 10 minutes. 5. Remove the wrapped rice from the steamer and place it in a bowl. 6. Heat a pan and cook together 1 cup coconut milk, 2 tablespoon sugar, and a pinch of salt, let it simmer for few minutes or till sugar dissolves completely. Pour this milk over the steamed rice and mix well. Keep the rice covered till all the coconut milk is soaked in (for about 15 to 20 minutes). 7. Coconut Milk Sauce: Heat a saucepan and cook the coconut milk along with sugar and salt till it comes to a slow boil. Then add cornflour mixture. Keep stirring to avoid any lumps and cook on low heat till it thickens. Remove from heat and set aside to cool. 8. To serve, place the steamed coconut rice on a plate. Keep fresh chopped mango on the side and pour 2 or 3 tablespoons of coconut milk sauce over the rice and mangoes. Sprinkle some roasted mung and serve. I love to make quesadilla especially as an iftar snack in the month of Ramadan. I feel it is a complete meal rather than calling it a snack. I have replaced its title which was supposed to be a 'Philly Cheese Steak Quesadilla' just to make it convenient for my readers. As it is a bit hard to find the authentic ingredients which go into this wrap. For example, a typical quesadilla is made of a corn tortilla, so here I have replaced it with a whole wheat flour tortilla. Similarly, the Provolone cheese has been substituted by the mozzarella cheese. If you see the video, the whole process looks very easy and simple with minimal ingredients, which makes it an ideal meal for kids who are fussy eaters. The more easy and simple the dish, the more popular it is. The sauce which you see in the picture is actually Spicy Mango Chili Dip which I had prepared to make Spicy Mango Chicken Wings. Also, check my very old post of Philly Cheese Steak Sandwich which is much similar to this one. Grilled flour tortilla, stuffed with vegetables and cooked chicken ideal for a weeknight dinner. 1. Heat oil in a pan and fry onion, capsicum, and mushrooms for few minutes. Do not overcook the vegetables and season with salt and pepper. Remove from pan and set aside. 2. Chop the chicken fillet into small bits. Heat oil in the same pan and fry chopped chicken pieces along with salt, pepper and soy sauce. Cook till chicken is fully done. 3. Make rotis with the dough and set aside covered. 4. Heat a grill pan or any nonstick pan. Add few drops of oil and place a roti. Spread a spoonful of cooked vegetables, some cooked chicken pieces, jalapenos and a handful of cheese. Place another roti on top and press slightly. Once the bottom part is toasted, turn the quesadilla over and grill on the other side till crisp. Remove from pan, cut into four pieces and serve hot. Chapli Kabab is a very popular street food and a Peshawari dish, also popular in India and Afghanistan. It is a flat round kabab which resembles the front part of the sandal, that is how it gets its name as 'chapli'. Chapli Kabab is mainly made out of ground beef or mutton along with fat content. But if you are trying to make it with chicken, you need to add a scrambled egg to give it extra softness. As you might have noticed that any kind of chicken mince kababs tend to dry out as we fry them. Another important and unique ingredient in this kabab is dry pomegranate seeds and tomato. These ingredients add extra sourness to this spicy kabab making it quite different from rest of the kababs. This kabab can be shallow fried as well as deep fried, the choice is yours. Normally it is shallow fried with lots of oil as there are 2 binding ingredients like chickpea flour and egg which keeps the kabab intact even while deep frying. I have tried to make a homemade chapli kabab masala just to avoid the store bought ones which are full of preservatives and additives. And I have tried to keep the spice mix as minimal and simple as possible. Also have a quick look at the video to see all the steps and procedure to make this soft, juicy and appetizing kabab. If the kababs break while frying, you can a little more of chickpea flour. I have mentioned 1 raw egg which should be a large one. If you have very small size eggs, then add 2 of them. Do not over mix after adding tomatoes, as it releases water. Add chopped tomato just before frying. Chicken Chapli Kabab is very delicate to handle, that is why I have used a cling wrap to shape it, and it becomes easier to take the shaped kabab in our hands and then transfer it to the pan. By using a cling wrap or a clean plastic sheet, you can make large chapli kababs as well. Adding sliced tomato to the kabab is optional, you can skip this step. Easy chicken mince kabab with a hint of sour and spicy flavors shaped into a flat patty along with tomato and fried to perfection. 1. Chapli Kabab Masala - Dry roast coriander seeds, cumin seeds and dry red chilies. Coarsely grind and set aside. Crush pomegranate seeds and set aside. In a clean dry bowl, add crushed spices, pomegranate seeds, garam masala powder, amchoor powder, black pepper powder and mix well. 2. In a large bowl, mix together chicken mince, chopped onion, chopped ginger, garlic, green chilies, eggs (scrambled and raw), chopped coriander leaves, chickpea flour, chapli kabab masala, and salt. Set aside in the refrigerator for 1 hour. Then add deseeded and chopped tomato and mix lightly. 3. Heat a flat pan and add cooking oil as required for shallow frying. 4. Take a cling wrap or a clean plastic sheet and place a slice of tomato. Now place 2 tablespoons of kabab mixture on the tomato slice and shape it into a flat and round kabab. Lift the plastic sheet and transfer the kabab to the frying pan. Shallow fry on both sides (10 minutes on each side) for 20 minutes. Mutton Rice Porridge is my personal favorite and a comforting one-pot meal. The best part of this recipe is that everything gets cooked in a single saucepan. For me comfort food is something which has less spice, it should all be in one bowl so that I can just curl up in a corner of the couch with it and should be of a slurpy consistency. This Mutton rice porridge passes all the tests of my ideal comfort food. There are various kinds of porridge or you can call it congee or kanji. In the southern parts of India, especially Kerela, coconut milk is also used as an extra rich flavor. You can see more One Pot Meal Ideas which I already have in my archives and also I would like to know what is your ideal comfort food when you are feeling low or if you are trying to recover from any sickness or during the cold winter nights. I have made this Mutton Rice Porridge post and video especially for this holy month of Ramadan. After breaking the fast, we need to go light on our stomach and not stuff it with unhealthy samosas and pies. I could not think of anything better than this soothing and comforting porridge which is packed with carbs, proteins and other nutrients which is enough to get the energy level back to normal. You can adjust the consistency according to your preference, as most of them prefer it to be a bit more thin and runny. Whereas, I prefer the consistency of a thick soup which makes me satisfied and feel full with just one bowl. Mildly spiced one bowl comforting meal with the combination of mutton and rice making it a slurpy warm porridge. 1. Wash and soak rice for 15 minutes. 2. Heat oil in a saucepan and add all the whole spices along with chopped onion. Fry till light brown. 3. Then add ginger and garlic paste, green chilies and mint leaves, and cook for few seconds. 4. Now add mutton mince, turmeric powder, salt and chopped carrot. Stir well and cook the mince for 1 minute till it combines with other spices. 5. Add soaked rice and discard the water. Stir well and add 3 cups of water (or more if needed). Cover and cook on medium-low heat for about 30 minutes. You need to keep stirring occasionally and keep adjusting the consistency by adding more water if needed. The rice should be fully overcooked and mashed. 6. Finally, add garam masala powder, lemon juice, and coriander leaves. Cook for a minute on high heat. 7. Garnish with ghee and fried onion and serve hot.